For the new generation, here at last was electricity as a new and exciting looking musical product. The flood-gates of opportunity had opened and the electric violinist became a real entity. How much impact has this electric violin made in the first century of existence; can anything be measured or is time still too close to say yet? In terms of Violin history 100 years is a short time, barely any time at all; and in terms of impact, seemingly very little indeed. However, the world is captured by electricity as if under a musical spell. Millions upon millions of people use electric music technology on a regular daily basis. The Violin has not escaped complete electrification but what exactly has changed? The idea of treating an electric violin as being a black box is a good starting point towards demystification, if needed. Electric violins receive the input from the player and output the ‘information’ as whatever noise-sound-music made. That is just what the electric violin can do. It is an instrument capable of receiving and transmitting impulses from a player to audience. As far as the electric violinist is concerned the ‘black-box’ reacts instantaneously, or as close as immediacy gets to the action of bow against string. This means that the journey of a musical thought, idea or emotion is arguably quicker and less hindered than its immediate wooden ancestor. Electrical signal travels extraordinarily quickly and can carry a huge range of subtle variation. What is actually heard is fluctuations in an electric circuit but amazingly enough, these translate directly and simply in to audio sound. Even more incredibly the audio sounds created are the notes played via the strings. The actual workings going on involve some science but not that much really. Bringing traditional violins to a state of wholesome vibration takes more effort than turning up the volume on an amplifier but the electric violin is no easier to play. It is simply much quicker to respond to every touch. The most expensive musical instrument in the world has been noted as being a violin by Stradivari. Rising through these types of auction-sale lists are electric musical instruments, currently the guitar. These are the kind of facts that can be confirmed from consulting books of records and watching what trades through auction houses. It is no good dwelling on the negative here, that this is a sign of sad times or arguing the actual and exact amounts of money swapping hands to try and disprove this point, the violin is better electric. For starters it is a reliable, cheaper alternative. If looked after well this violin lasts. Whether or not it is liked is of no real concern and it can not be a sustained dispute. That this violin is here and here to stay is found in every electrical microphone and pickup used as a matter of course in playing, recording and broadcasting. The classical sound of the Violin is now more commonly heard as electrically driven speakers. The restrictions of body design were broken by 1900 and since then gradually the electric violin has emerged. To date this is an instrument with no set form and no agreed technique. The only rules strongly emerging are that it be an instrument capable of being very quiet yet also capable of masses of volume with a great tonal range. As many violinists, producers, composers, teachers and audiences among others still generally expect to hear the sound of an acoustic violin when confronted with an electric violin, many electrical sounds are yet to be explored fully. With the application of electricity to violins many problems of modern-day performance are solved but fundamental new questions have been raised. What terminology should be used to describe the instrument? Then perhaps more bitterly disputed, what of the tonal quality of the electric violin? Again if the quality was poor at the beginning of the century, should this infant instrument be given the opportunity to improve or be drowned at birth by intolerance and arch conservatism? Will the march of progress consume the classically shaped acoustic violin as it has all other old instruments? At the time of the first experiments in the first quarter of the twentieth century, which patent offices were sent details of musical instruments and musical devices that did not fit easily into the recognised category? Was their differentness ample ground for rejection or was its embryonic quality too impure that its potential should be left unexplored? It is difficult to find evidence of the prime movers or the prime rejecters. Recollections conflict and unfortunately some records show chronological differences. Also electric, electrified, electronic, amplified, semiacoustic and electroacoustic prefixing the word violin are interchanged to create great confusion in trying to piece together a clearer picture. The term electric violin is used here to mean an instrument without the classical resonating body, that is, without an acoustic chamber. Without electrical circuits, amplification and speakers an electric violin is virtually useless, a skeleton with few muscles. Having the majority of muscles out of the way allows the violinist to concentrate on how the elemental structure actually works without the ears having to be blasted at close range by a full-muscled sound. However, the term electric violin is also used here to include any violin that needs or makes use of electricity in just about any way it has to make the noise, sound or music heard. The early history of the electric violin is somewhat cloudy, there being a number of noted makers but few surviving accounts of the actual instruments in very detailed terms. This will in part be because the first experiments and instruments were made during the period between the two world wars. Needs changed, things shifted. Although many records vanished, fortunately inventions were registered and players made some audio and visual recordings. The question as to whom did what when and where first is impossible to answer as is typical throughout the history of the violin. It is a fabulous sticking point. A translation of Leopold Mozart’s words on the subject of the origins of the violin apply equally to the electric violin. Electric violins are used in music making today especially in popular music, though not nearly as much as other electrical instruments and not to any great extent in what is usually referred to as the classical world. Good electric violins are versatile instruments, very sensitive to the demands of any violinist’s music making. They are capable of producing high quality sounds that are away beyond the practical working scope of the traditional instrument – although the sounds of the acoustic violin are also part of the electrical instrument’s repertoire. This imitaion of an acoustic violin is by far the most exploited sound of an electric violin. The incredible repetoire of sounds are explored by few commercial artists today. The electric stringed instrument is becoming essential in today’s noise polluted environment. Its flexibility for the performer means that it can be heard above the volume level used at large outdoor events. If required, it can be played in very small rooms its sound qualities being adapted accurately to that environment electronically. There is the added advantage of choice, even when practising, whether or not to disturb the neighbours. The electric violin can do this whilst maintaining an even quality of sound. The key variations revolve around how well it is made and played. It is the quality of the sound that remains a point of argument. 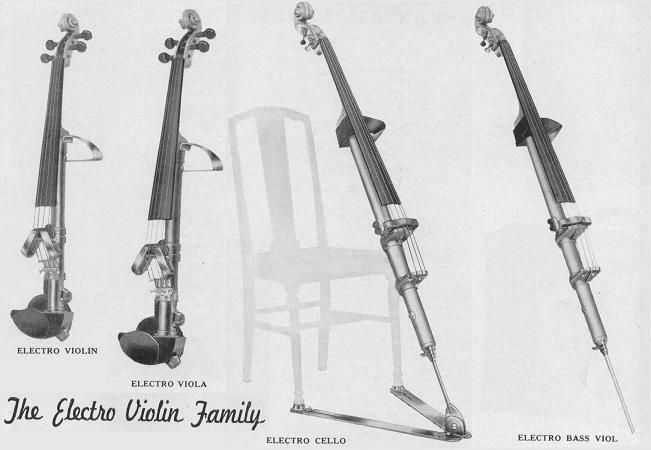 When electric violins first appeared, they probably sounded awful. Most violinists sound awful in their earlier years. Some instrument makers undoubtedly suffered more than they deserved at times, solely because of bad performances. A loss shown in the scant recorded information? It has to be admitted that there were and still are badly designed and badly crafted instruments – this having an influence on the player’s opinion of the instrument and a negative effect on the audience. Original reaction to the primitive instruments is understandable – they looked odd, their manner of operation was different, the sound was changed; it was a novelty. Such opinion towards today’s electric violins seems misplaced. To reject today’s instruments is akin to rejecting modern hi-fi because the original gramophones were imperfect in their reproduction of sound. Without the application of electricity the violin would be much less seldom heard. Electricity and the electric violin have provided new life and new challenges for the violinist. There are notable figures in the profession who have excelled in being electric violinists. Stephan Grapelli, Jean-Luc-Ponty, Stuff Smith, Svend Assmussen are just four; the list is growing and their performances can be found in archive music libraries, many on shelves in large record shops. However, attention first should be given to the Makers.